South Squad quarterback Derek Carr of Fresno State rolls out to pass during practice at Fairhope Municipal Stadium. 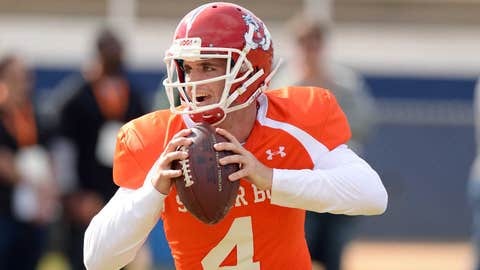 MOBILE, Ala. (AP) — Derek Carr isn’t in nearly the same situation as his older brother going into the Senior Bowl, and that’s not entirely a bad thing. David Carr wound up being the No. 1 overall draft pick by the expansion Houston Texans after playing in the 2002 game, leading to a career that never took off. The younger Carr has been trying to enhance his chances of being a first-round pick leading up to Saturday’s showcase game for senior NFL prospects. No rookie team building from scratch awaits either. "There’s not an expansion team anymore," Fresno State’s Derek Carr said. "A team isn’t starting fresh. These teams are all great. They’re just one step away. Our situations are completely different. "Our situations are different, but there’s so much to learn from it." None of the Senior Bowl quarterbacks are regarded as first-round locks, much less top overall picks. The first quarterbacks taken figure to be juniors Johnny Manziel, Teddy Bridgewater and Blake Bortles, in some order. WHAT DOES JOE BANNER THINK OF JOHNNY FOOTBALL? The Senior Bowl passers are hoping to wow an NFL team and move up the ladder. Florida State’s E.J. Manuel wound up being the No. 16 pick by Buffalo after earning MVP honors in last year’s game. From the NFL’s perspective, the week’s first few practices are what really matters in evaluating players on the field. The game is of less importance but South coach Gus Bradley is also looking to gauge leadership skills from his rotating group of QBs. "I want to see our quarterbacks lead. They need to lead a team," said Bradley, coach of the Jacksonville Jaguars. "If we can become a team quickly, now there’s another evaluation that takes place: Can these quarterbacks lead our team that we developed in four days? We’ll compete any way we can to find out about these guys." The first step was the measurable, height and weight. Virginia Tech’s Logan Thomas won that category at a shade under 6-foot-6 and 250 pounds. Then there’s a week of competition, meetings, drills — and endless streams of questions from NFL teams. Such as: "Name every use you can think of for a brick in a minute," said Eastern Illinois’ Jimmy Garoppolo, who was MVP of the East-West Shrine Game. "I went for about 20-30 seconds. You think of some crazy things when you’re thinking about that, that’s for sure." The Senior Bowl pits Carr and the South’s small-school quarterbacks against the products of big-name programs leading the North. Carr is joined by San Jose State’s David Fales and Garoppolo, a late addition after Alabama’s AJ McCarron opted not to play. Georgia’s Aaron Murray and Zach Mettenberger were invited to the game but are recovering from knee surgeries. The North is led by Thomas, Clemson’s Tajh Boyd and Miami’s Stephen Morris. "Obviously with games like this you’ve got to compete with some big-name guys and those big-school guys," Fales said. "And these guys are the best, too, so to get a chance to all be out there on the field and compete and showcase our abilities is huge." They all posted big college numbers, especially Carr. The nation’s leader in total offense and touchdown passes, Carr was the fourth quarterback in major college history to pass for 5,000 yards and 50 touchdowns in a season. Boyd passed for nearly 12,000 yards in his career with Clemson. Like Bradley, he wasn’t treating the week as just about showing off his arm. "I feel like I can throw the ball from any angle," Boyd said. "I can make any throw. "I can move around and do that stuff, but really for me, it’s just trying to lead the best way I know how." Garoppolo hails from the same FCS school as Dallas Cowboys quarterback Tono Romo and New Orleans Saints coach Sean Payton. 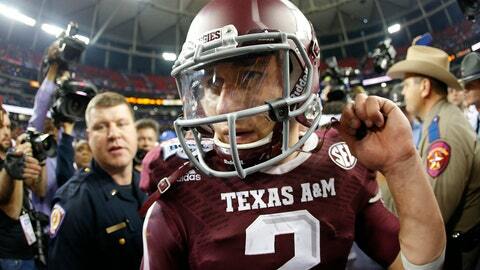 He broke many of their records, and now is trying to follow Romo into a starting NFL job. Garoppolo embraces the comparisons, which he said was even made to him by Cowboys officials. "It’s very motivating," said the Walter Payton Award winner as the top offensive player in the FCS. "He came from a small school. Sean Payton had a great career at Eastern, too. The quarterback tradition at Eastern is very well known. I’m just trying to keep it going, really, and take it to the next level."